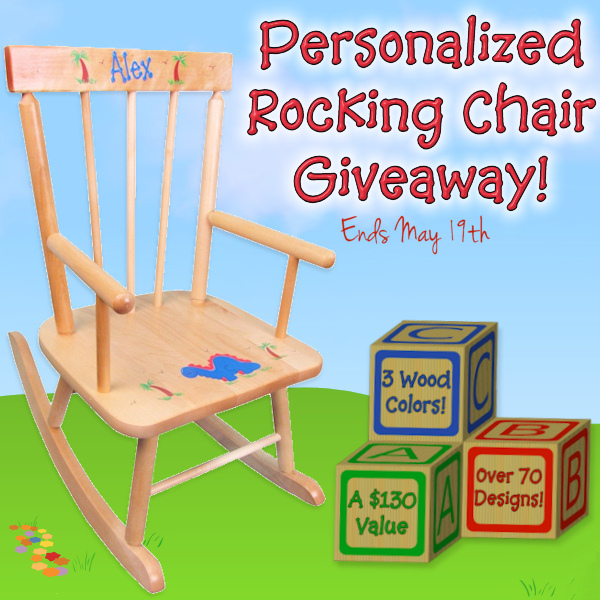 Rocking chairs are a great gift for people of all ages. I know for me I find it soothing. Children love the soft sway of a rocking chair like they were rocked as babies in. A personalized item make a gift much more personal and memorable. I know for me I loved it when my Mom would get my sister and I personalized items. I wish I had some of the items still. With something like a rocking chair it can be cherished for many years and be passed down to grandchildren one day. Not to mention how cute they are! We at Frugal Family Tree are co-hosting a giveaway from Baby Gifts Gift Baskets. 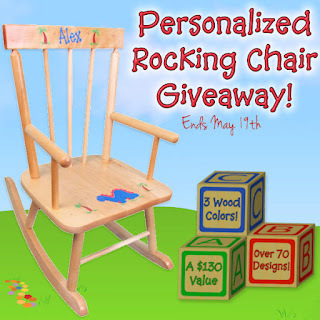 A rocking chair also makes a cute first birthday gift or for the holidays for photos to be done. So many cute ideas for the use of a rocking chair. I know my son would love one, it would look so cute in his room. Enter the giveaway using the Rafflecopter widget below. When you complete the mandatory entry (commenting on this post), various other entry options will become available. Any option is acceptable, but the number of entries per person are limited to the number indicated in the contest form. Entries will be reviewed and duplicate or uncompleted entries will be removed. Giveaway sweepstakes is open to all residents of the 48 Contiguous States and only to those 18 years of age or older. Winner will be notified via e-mail so make sure you provide a valid address. Winners must respond within three days of being contacted. If you do not respond within that period, another replacement winner will be chosen. Prize will be fulfilled by the contest sponsor http://www.baby-gifts-gift-baskets.com. Sweepstakes ends at midnight EST on May 19th, 2013. The sweepstakes winner will be announced by May 26th, 2013.
your outdoor yard projects now. There is no far better method to get prepared than by getting organized. The personalized ice cream bowl. I would most likely buy the personalized round table and chair set for my daughter's room. She would love her name on the chair and I think the happy meadows graphics are sweet.